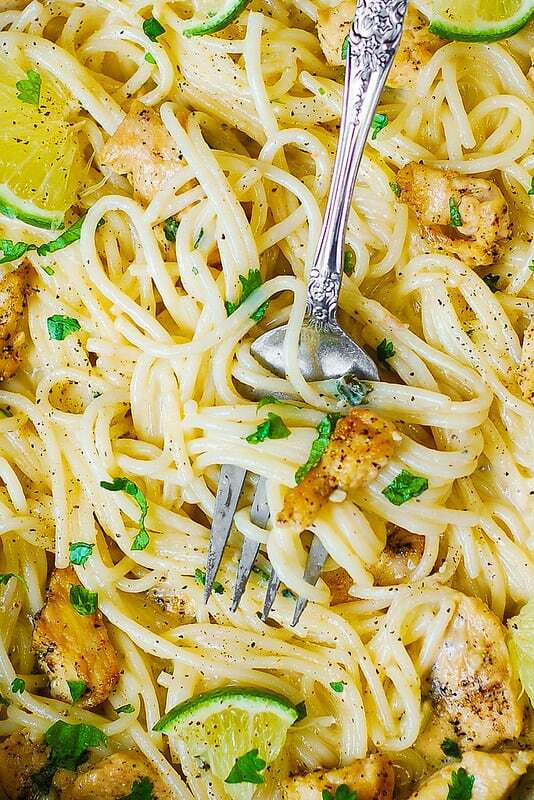 Cilantro-Lime Chicken Pasta – delicious spaghetti in a creamy white cheese sauce with lots of flavor! The sauce is made by cooking garlic, adding freshly squeezed lime juice and cilantro and then mixing everything in a homemade alfredo sauce! Delicious Summer pasta! 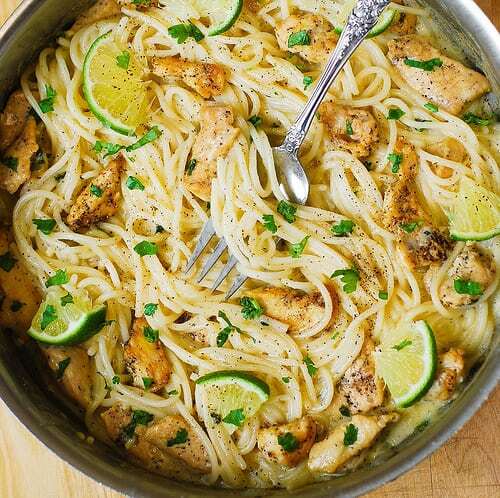 If you’re looking for quick and easy chicken dinner ideas – cilantro lime chicken pasta is a fantastic choice. The recipe takes only 30 minutes from start to finish and it uses very simple, basic ingredients. You’ll love the lime, garlic, and cilantro flavors combined in this creamy dish! Perfect dinner in the Summer! Use freshly squeezed lime juice. Squeeze 1 large lime to produce about 2 tablespoons of lime juice. If you do use bottled lime juice – use smaller amount than indicated in the recipe. Freshly squeezed lime juice is very flavorful, and that’s what should be used in this recipe. Save some cooked pasta water. If your creamy sauce gets too thick, add pasta water to the sauce to thin it out. Use either chicken breast or skinless boneless chicken thighs or chicken tenderloins. Slice the chicken before cooking. To make this pasta gluten free, use gluten free brown rice pasta. If you use gluten free pasta, make sure to rinse it after you cooked it in boiling water – it will prevent it from getting mushy. Use either shredded Mozzarella cheese or shredded Parmesan cheese to make the sauce. 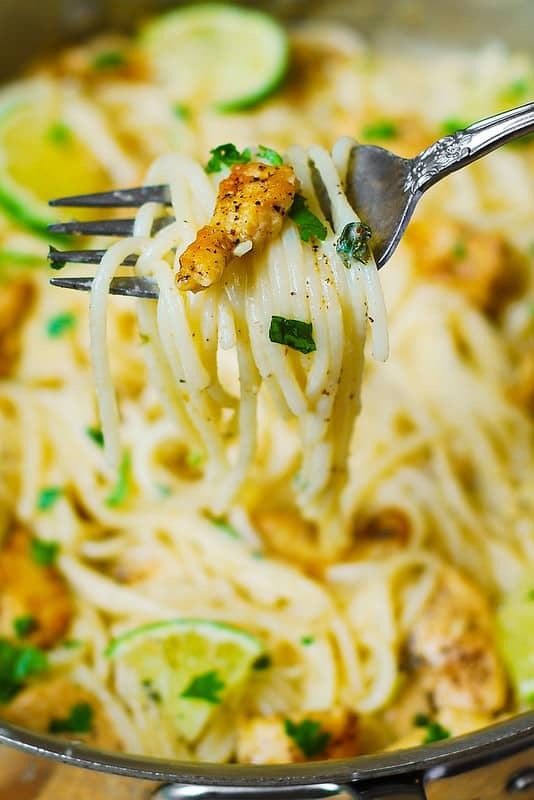 Chicken Pasta with Creamy Cilantro-Lime Alfredo Sauce - delicious spaghetti in a creamy white cheese sauce with lots of flavor! Easy to make: only 30 minutes from start to finish! Delicious Summer recipe. Heat olive oil in a large skillet on medium-hot heat. Generously season sliced chicken with salt and pepper, add to the hot skillet and cook for about 5 minutes until done. Remove sliced chicken from the skillet. To the same skillet, add minced garlic, lime juice and chicken broth. Cook for 1-2 minutes on high heat, deglazing and scraping the skillet until the liquid is reduced and making sure garlic does not burn and brown too much. Mix in chopped cilantro. Add heavy cream and milk. Bring to boil, the immediately add cheese and mix in until melted, while boiling. Then, remove from heat. Cook pasta according to package instructions, drain, reserving some cooked pasta water. Add pasta to the sauce, along with the half of the chicken. Mix everything in and season pasta with more salt, if needed. Top with the remaining half of the chicken and more chopped cilantro. My family IS A HUGE FAN of your recipe. Thank you! I did a very bold move and did not use the heavy milk and still came out delicious! When I added the milk and cream it separated! Still tasted ok but not appetizing. I followed the directions—what did I do wrong?! This is a great recipe, easy and quick. I just adjusted to my family members. Made this for dinner tonight – it was delicious. 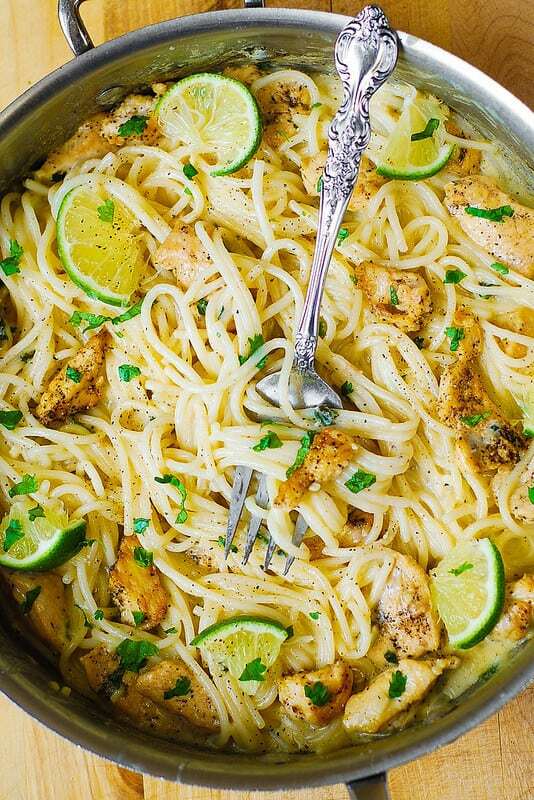 The lime flavor gave this creamy dish a refreshing feel!